The cassandra-stress tool is a Java-based stress testing utility for basic benchmarking and load testing a Cassandra cluster. Quickly determine how a schema performs. Understand how your database scales. Optimize your data model and settings. The YAML file supports user-defined keyspace, tables, and schema. The YAML file can be used to design tests of reads, writes, and mixed workloads. When started without a YAML file, cassandra-stress creates a keyspace, keyspace1, and tables, standard1 or counter1, depending on what type of table is being tested. These elements are automatically created the first time you run a stress test and reused on subsequent runs. You can drop keyspace1 using DROP KEYSPACE. You cannot change the default keyspace and tables names without using a YAML file. counter_read Multiple concurrent reads of counters. The cluster must first be populated by a counter_write test. counter_write Multiple concurrent updates of counters. mixed Interleave basic commands with configurable ratio and distribution. The cluster must first be populated by a write test. print Inspect the output of a distribution definition. read Multiple concurrent reads. The cluster must first be populated by a write test. user Interleave user provided queries with configurable ratio and distribution. version Print the cassandra-stress version. write Multiple concurrent writes against the cluster. When entering the help command, be sure to precede the option name with a hyphen, as shown. -col Column details, such as size and count distribution, data generator, names, and comparator. -errors How to handle errors when encountered during stress testing. retries=N Number of times to try each operation before failing. ignore Do not fail on errors. skip-read-validation Skip read validation and message output. 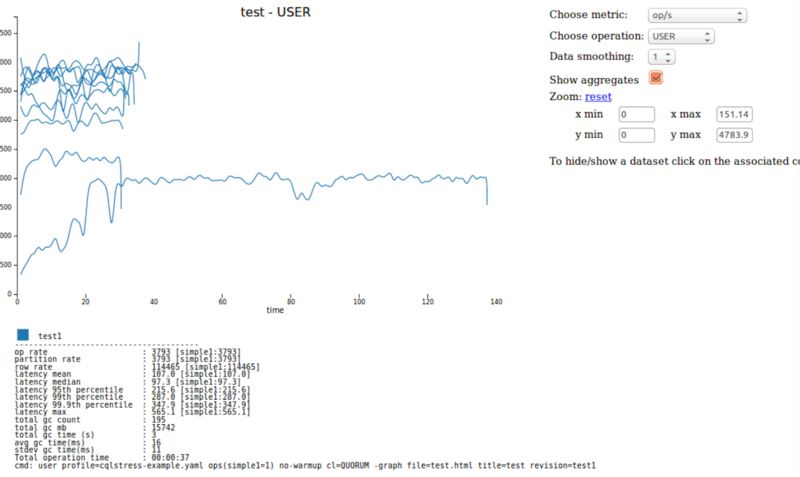 -graph Graph results of cassandra-stress tests. Multiple tests can be graphed together. -insert Insert specific options relating to various methods for batching and splitting partition updates. -log Where to log progress and the interval to use. -mode Thrift or CQL with options. -node Nodes to connect to. -pop Population distribution and intra-partition visit order. -port Specify port for connecting Cassandra nodes. Port can be specified for Cassandra native protocol, Thrift protocol or a JMX port for retrieving statistics. threads=N number of clients to run concurrently. throttle=N throttle operations per second across all clients to a maximum rate (or less) with no implied schedule. Default is 0.
fixed=N expect fixed rate of operations per second across all clients with implied schedule. Default is 0.
threads>=N run at least this many clients concurrently. Default is 4.
threads<=N run at most this many clients concurrently. Default is 1000.
auto stop increasing threads once throughput saturates. -schema Replication settings, compression, compaction, and so on. -sendto Specify a server to send the stress command to. cl=? Set the consistency level to use during cassandra-stress. Options are ONE, QUORUM, LOCAL_QUORUM, EACH_QUORUM, ALL, and ANY. Default is LOCAL_ONE. clustering=DIST(?) Distribution clustering runs of operations of the same kind. duration=? Specify the time to run, in seconds, minutes or hours. err<? Specify a standard error of the mean; when this value is reached, cassandra-stress will end. Default is 0.02.
n>? Specify a minimum number of iterations to run before accepting uncertainly convergence. n<? Specify a maximum number of iterations to run before accepting uncertainly convergence. n=? Specify the number of operations to run. no-warmup Do not warmup the process, do a cold start. truncate=? Truncate the table created during cassandra-stress. Options are never, once, or always. Default is never. # Read two hundred thousand rows. # Read rows for a duration of 3 minutes. # Read 200,000 rows without a warmup of 50,000 rows first. Changes the replication strategy to NetworkTopologyStrategy and targets one node named existing. cassandra-stress write n=500000 no-warmup -node existing -schema "replication(strategy=NetworkTopologyStrategy, existing=2)"
When running a mixed workload, you must escape parentheses, greater-than and less-than signs, and other such things. This example invokes a workload that is one-quarter writes and three-quarters reads. The ratio parameter requires backslash-escaped parenthesis. The value of n used in the read phase is different from the value used in write phase. During the write phase, n records are written. However in the read phase, if n is too large, it is inconvenient to read all the records for simple testing. Generally, n does not need be large when validating the persistent storage systems of a cluster. The -pop dist=UNIFORM\(1..1000000\) portion says that of the n=100,000 operations, select the keys uniformly distributed between 1 and 1,000,000. Use this when you want to specify more data per node than what fits in DRAM. In the rate section, the greater-than and less-than signs are escaped. If not escaped, the shell attempts to use them for IO redirection: the shell tries to read from a non-existent file called =256 and create a file called =16. The rate section tells cassandra-stress to automatically attempt different numbers of client threads and not test less that 16 or more than 256 client threads. This example demonstrates loading into large clusters, where a single cassandra-stress load generator node cannot saturate the cluster. In this example, $NODES is a variable whose value is a comma delimited list of IP addresses such as 10.0.0.1, 10.0.0.2, and so on. Note: Check the documentation of the transport option for SSL authentication. Note: Cassandra authentication and SSL encryption must already be configured before executing cassandra-stress with these options. The example shown above uses self-signed CA certificates. This option must be inserted before the mode option, otherwise the cassandra-stress tool won't apply truncation as specified. The population distribution can be defined for any column in the table. This section specifies a uniform distribution between 10 and 30 characters for username values in gnerated rows, that the values in the generated rows willcreates , a uniform distribution between 20 and 40 characters for generated startdate over the entire Cassandra cluster, and a Gaussian distribution between 100 and 500 characters for description values. The last section contains a query, read1, that can be run against the defined table. cql: select * from users where username = ? and startdate = ? The user option is required for the profile and opt parameters. The value for the profile parameter is the path and filename of the .yaml file. In this example, -n specifies the number of batches that run. The values supplied for ops specifies which operations run and how many of each. These values direct the command to insert rows into the database and run the read1 query. How many times? Each insert or query counts as one batch, and the values in ops determine how many of each type are run. Since the total number of batches is 1,000,000, and ops says to run three inserts for each query, the result will be 750,000 inserts and 250,000 of the read1 query. Use escaping backslashes when specifying the ops value. For more information, see Improved Cassandra 2.1 Stress Tool: Benchmark Any Schema – Part 1. In Cassandra 3.2 and later, the -graph option provides visual feedback for cassandra-stress tests. A file must be named to build the resulting HTML file. A title and revision are optional, but revision must be used if multiple stress tests are graphed on the same output.